I was taken on a sneak preview visit to The High Line in New York. 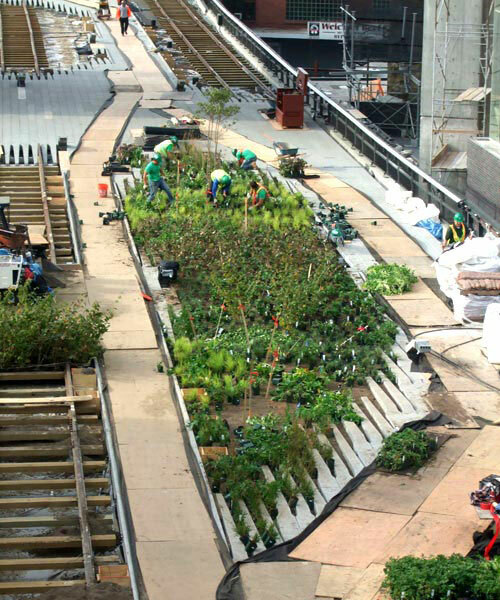 It’s an elevated public park on a 1.5 mile elevated railway that runs along the West Side of Manhattan. Everyone is rightly proud that this historic rail structure has been saved from being razed by developers. 150 million dollars have been found to to create a “one-of-a-kind recreational amenity…a linear public place where you will see and be seen”. It’s a spectacular site, and the work is being beautifully done – but the project feels strangely out-of-date before it even opens. 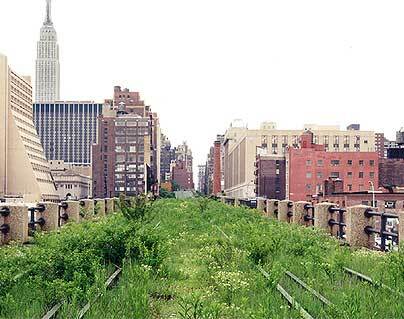 The High Line website features “before” images (above) of the site before restoration, with masses of weeds and greenery. The project now, that I visited (see below), features concrete walkways, high-design benches, and artful planting. What I missed, amidst the designerly order, was the sense of abundance it had when still abandoned. The good news is that Phases 2 and 3 of the project venture into vast unused railway yards – perfect sites for city farms. This entry was posted in [no topic]. Bookmark the permalink. Trackbacks are closed, but you can post a comment.